Although resting B cells as APC are tolerogenic for naive T cells in vivo, we show here that they can provide all the costimulatory signals necessary for naive T cell proliferation in vivo and in vitro. In the absence of an activating signal through the B cell Ag receptor, T cell proliferation after Ag recognition on resting B cells depends on CD40 expression on the B cells, implying that naive T cells use the membrane-bound cytokine, CD40 ligand (CD154), to induce the costimulatory signals that they need. Induction of B7-1 (CD80) and increased or sustained expression of CD44H, ICAM-1 (CD54), and B7-2 (CD86) are dependent on the interaction of CD40 ligand with CD40. 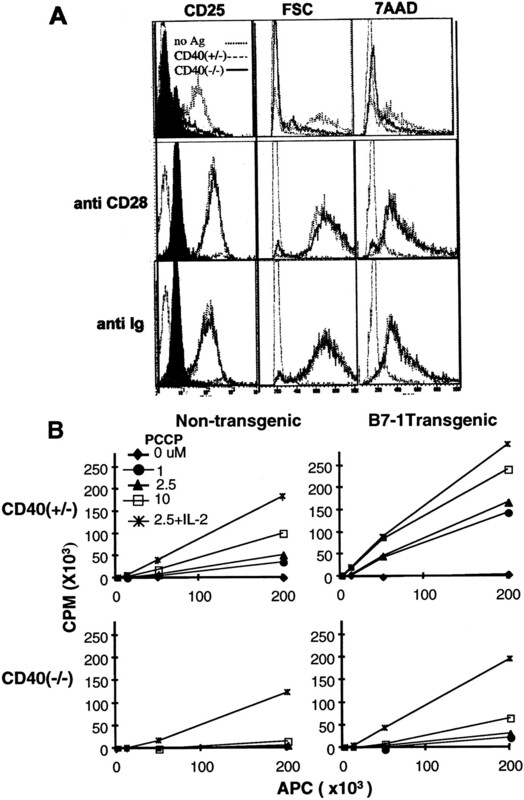 Transient expression (12 h) of B7-2 is T cell- and peptide Ag-dependent, but CD40-independent. Only sustained (≥24 h) expression of B7-2 and perhaps increased expression of ICAM-1 could be shown to be functionally important in this system. T cells cultured with CD40-deficient B cells and peptide remain about as responsive as fresh naive cells upon secondary culture with whole splenic APC. Therefore, B cells, and perhaps other APC, may be tolerogenic not because they fail to provide sufficient costimulation for T cell proliferation, but because they are deficient in some later functions necessary for a productive T cell response. The outcome of the interaction between an Ag-specific B cell and an Ag-specific T cell can be tolerance or immunity, depending on the state of activation of the T cell and the B cell, although the rules and the molecular interactions that govern the outcome are still poorly understood. B cells are counted among the “professional” APC because they must present Ag to CD4 helper effector T cells to participate in T cell-dependent Ab responses (1). In vivo, B cells also drive CD4 T cell expansion (2, 3, 4, 5), direct CD4 T cell differentiation toward helper effector function (6, 7), and can break T cell tolerance to a self-Ag for which they are specific (8). On the other hand, B cells in competition with other kinds of APC are unable to prime T cells in naive animals (9) and can induce tolerance in both CD4 and CD8 T cells (10, 11, 12, 13, 14, 15). B cells efficiently present monovalent Ags bound to their Ag receptors (16), and B cells specific for monovalent, soluble self-Ags such as complement component C5 are not deleted because such Ags do not deliver a signal through the B cell Ag receptor (17). Therefore, we have proposed that B cells specific for soluble self-Ags may recirculate as tolerogenic APC to contribute to self-tolerance to such Ags in the CD4 T cell compartment (18). A key regulator of Ag-specific T/B cell interactions is CD40 ligand (CD40L;5 CD154), the membrane-bound ligand for CD40 and the major mediator of contact-dependent help for B cell proliferation and differentiation in the Ab response (19, 20). Mice and humans deficient in CD40L or CD40 lack secondary Ab responses and germinal centers (19, 21) and show defects in T-dependent macrophage activation (22). In addition to these effector cell roles, it is now amply demonstrated that activated CD4 T cells use CD40L/CD40 to elicit from various kinds of APC, including B cells, the costimulatory signals that they need to proliferate and differentiate to effector function (22, 23, 24, 25, 26, 27). It has been proposed that Abs to CD40L inhibit autoimmunity and allograft rejection by blocking the ability of CD4 T cells to up-regulate expression of B7 and other costimulatory activities in APC (12, 28, 29, 30), although blocking of direct signals to T cells through CD40L has also been suggested (31). Resting B cells possess little or no costimulatory activity, and have been reported to be ineffective APC for naive T cells in vitro (32, 33, 34). Signals through the Ag receptor or other activating signals can up-regulate costimulatory activities and convert B cells into effective APC for T cells in vitro (32, 33, 35, 36, 37, 38). Among these effective signals is CD40 ligation (22, 23, 24, 25, 39), raising the possibility that naive T cells could use CD40L/CD40 to convert resting B cells into effective APC. However, there is no consensus in the literature about the ability of naive T cells to express functionally significant amounts of CD40L in response to Ag presented by resting B cells (25, 40, 41) or to proliferate at all in response to Ag on resting B cells in vitro (32, 34, 38, 42). There are also conflicting reports about which costimulatory signals are dependent on CD40L/CD40 and are important for T cell proliferation (5, 24, 25, 38, 39, 40, 43). These questions pertain to the mechanism by which B cells and other tolerogenic APC induce peripheral tolerance in T cells in vivo and, more generally, whether T cell proliferation is a prerequisite for tolerance. In this study, we have looked directly at Ag-specific interactions between naive T cells and small, resting B cells. We show that naive T cells induce small B cells to express the costimulatory signals that the T cells need to proliferate in vitro and in vivo in the absence of other APC or B cell Ag receptor signaling, although the B cells are much less effective than dendritic cells. Using CD40 knockout mice (21), we show that CD40 on the B cell is necessary for T cell proliferation and for sustained induction of various costimulatory molecules, only some of which are necessary for T cell proliferation. Although naive T cells fail to proliferate because they lack costimulation, they are not rendered anergic by recognizing Ag on CD40−/− B cells in vitro. Mice were housed under specific pathogen-free conditions at the Oregon Health Sciences University animal facility. Two lines of TCR αβ transgenic mice, AND and AD10 (44), were gifts of Dr. Steven Hedrick (University of California at San Diego, La Jolla, CA). The AD10 line was maintained on a B10.BR/SgSnJ background, and the AND line was maintained on a C57BL/10J background. CD40−/− mice (21), kindly provided by Dr. Hitoshi Kikutani (Osaka University, Osaka, Japan), were maintained on a C57BL/6J background and then were crossed and backcrossed to B10.BR/SgSnJ mice. Homozygous H-2k/k offspring were selected by absence of I-Ab on peripheral blood cells and were maintained by breeding CD40+/− to CD40−/− mice. The genotype of CD40 was determined by PCR (21) and/or by staining peripheral blood cells with anti-CD40 Ab. FVB/N mice transgenic for the murine B7-1 coding region cDNA under the control of the Ig-μ enhancer and promoter element (45), kindly provided by Dr. G. Freeman (Harvard Medical School, Boston, MA), were crossed to CD40−/−, H-2k/k mice, and B-7 transgenic progeny were backcrossed to CD40−/−, H-2k/k mice. CD40 and B7-1 expression were determined by flow cytometry on peripheral blood cells. All other mice were from The Jackson Laboratory (Bar Harbor, ME). R-PE anti-CD86 (GL1), R-PE anti-CD80 (1G10), FITC anti-CD25 (3C7), R-PE anti-Vβ3 (KJ25), biotin anti-Vα11 (RR8-1), FITC anti-B220 (RA3-6B2), biotin anti-CD69 (H1.2F3), biotin anti-CD54 (3E2), Cy-Chrome anti-CD44 (IM7), Cy-Chrome streptavidin, FITC anti-CD40 (3/23), R-PE rat IgG2a (isotype standard), R-PE rat IgG2b (isotype standard), FITC rat IgM (isotype standard), unlabeled anti-CD28 (37.51), anti-CD80 (16-10A1), anti-CD86 (GL1), anti-CTLA4 (CD152, 9H10), and rat IgG2a were purchased from PharMingen (San Diego, CA). R-PE streptavidin, F(ab′)2 goat anti-mouse IgG + IgM (H+L), and syrian hamster IgG were purchased from Jackson ImmunoResearch (West Grove, PA). Anti-CD4 (GK1.5), anti-CD8 (3.168.8), anti-rat κ (MAR 18.5), anti-MHC class II (M5/114.15.2), anti-B220 (RA3.3A1), and anti-Thy 1.2 (HO13.4, J1J10) were prepared from 45% saturated ammonium sulfate precipitates of hybridoma culture supernatants. Purified anti-CD44H and anti-CD54 were a gift from Dr. Yang Liu (Ohio State University Medical Center, Columbus, OH). Anti-CTLA4 was also purified on protein G from culture supernatants of the 9H10 hybridoma, which was a gift from Dr. James Allison (University of California, Berkeley, CA). The CD40Ig fusion protein was purified as described (20) from a plasmacytoma cell line transfected with a plasmid encoding the extracellular portion of human CD40 fused to the hinge, CH2, and CH3 domains of human Igγ1 heavy chains (KK10 was a gift from Dr. M. Kehry, Boehringer Ingelheim, Ridgefield, CT). A total of 105–106 cells were incubated on ice in 100 μl of PBS containing 1% calf serum and 0.1% sodium azide for 15–30 min with the indicated Abs at saturating concentrations. Cells were washed twice before incubation with a secondary Ab or strepavidin. For estimation of DNA content, the cells were stained and fixed overnight at 4°C in 1% paraformaldehyde in PBS with azide and 1% calf serum. The cells were then washed and resuspended in 25 μg/ml 7-aminoactinomycin D (7AAD; Sigma, St. Louis, MO) in 0.025% Nonidet P-40 in PBS and incubated in the dark at 4°C for 90 min. Otherwise, cells were analyzed immediately after staining on a FACSCalibur flow cytometer using CellQuest acquisition/analysis software (Becton Dickinson, San Jose, CA). Live cells were discriminated from dead cells by forward and side light scatter or by incubation for 15 min before acquisition with 1 nM TO-PRO-3 (Molecular Probes, Eugene, OR), a dye that labels dead cells in the FL4 channel (46). The TCR transgenic T lymphocyte population (>80% Vβ3-positive by flow cytometry) was prepared from spleen cell suspensions from AND mice. Erythrocytes were lysed and B cells were depleted by Cellect T lymphocyte isolation columns (polyclonal goat anti-mouse IgG (H+L) affinity column) (Biotex Laboratories, Edmonton, Canada) according to directions provided by the manufacturer. Spleen cells from AD10 TCR transgenic mice were isolated on Ficoll-Hypaque (Lympholyte-M, Cedarlane Laboratories, Hornby, Ontario, Canada) without hypotonic lysis, washed, incubated with 2 μM CFSE (Molecular Probes) in 0.1% BSA in PBS at 37°C for 10 min (47). They were then washed in HBSS (HEPES-buffered HBSS) with calf serum, and resuspended without serum. A total of 30 × 106 CFSE-labeled spleen cells, containing 4 × 106 TCR transgenic (Vα11- and Vβ3-positive) CD4 T cells, were injected i.v. into normal B10.BR mice. Up to 8 × 108 erythrocyte-depleted spleen cells were suspended in 10 ml of HBSS containing 1 mg/ml of DNase H (Sigma). Cells were incubated at room temperature for 15 min before being loaded into the standard chamber of a JE-5.0 elutriation system (Beckman, Palo Alto, CA). The elutriator was run at 3200 rpm and 4°C with cold HBSS supplemented with 1% calf serum. Two 400-ml fractions were collected, a 16-ml/min fraction containing debris and a 19-ml/min fraction containing small lymphocytes enriched for B cells. The small B lymphocyte population was 87–95% B220-positive by flow cytometry and had a mean diameter of 6 microns as determined with a Coulter Counter (Coulter Electronics, Hialeah, FL). Fewer than 4% of the cells had a mean diameter greater than 7 microns. Large spleen cells were defined as the remainder of the cells recovered from the elutriator after the small B cell fraction was collected and includes substantial numbers of small lymphocytes as well as larger cells. In the CFSE experiment, CD40−/− or normal B10.BR spleen cells were pulsed with 10 μM pigeon cytochrome c peptide residues 88–102 (KAERADLIAYLKQAT) (PCCP, synthesized and purified by HPLC by BioSynthesis, Lewisville, TX) for 1 h at 37°C in culture medium with 1% FBS before elutriation. Spleens were removed and digested with collagenase was as described by Inaba et al. (48). The cell suspension was gently layered onto a 45/60/70% Percoll (Pharmacia Biotech, Uppsala, Sweden) density gradient in a 30-ml polycarbonate tube. The tubes were spun in a tabletop Sorvall centrifuge at 3000 rpm at 4°C for 13 min. The cells at the medium/45% and 45/60% interfaces were collected, washed, suspended in RPMI 1640 with 10% FBS, and plated onto 60-mm tissue culture plates (1.4 × 107 cells/plate). The cells that initially adhered but became nonadherent after overnight culture were collected as described (48). Erythrocyte-depleted cells from B10.BR mice were suspended at 2 × 107 cells/ml in a mixture of anti-T lymphocyte Abs (GK1.5, 3.168, HO13.4, and J1J10) in HBSS and were placed on ice for 20 min. Cells were then washed and suspended in a saturating concentration of anti-rat κ Ab (MAR 18.5). After a 15-min incubation on ice, cells were incubated at 37°C in a 1:10 dilution of guinea pig complement (Pel-Freez Biologicals, Rogers, AR) in HBSS for 40 min. Cells were cultured with various additions in 200 μl of RPMI 1640 medium supplemented with 10% FBS, 0.2 mM l-glutamine, 5 × 10−5 M 2-ME, 2 mM HEPES, 100 U/ml penicillin, and 100 μg/ml streptomycin in 96-well flat-bottom polystyrene tissue culture plates. To estimate cell proliferation by measuring DNA synthesis, wells were pulsed for 10–12 h on day 3 with 1 μCi of low specific activity (2 Ci/mmol) tritiated thymidine (NEN, Boston, MA). Cultures were subsequently harvested onto glass fiber filters which were washed, dried, and counted by liquid scintillation. Data points represent the means of triplicate cultures. Background thymidine incorporation in the absence of PCCP (usually less than 1000 cpm) was subtracted. First we wanted to determine whether naive T cells proliferate in response to Ag presented by resting B cells and, if so, whether the CD40L/CD40 interaction is necessary for the T cell response. Small, resting lymphocytes enriched in small B cells were isolated from spleens of I-Ek-positive CD40-deficient or I-Ek-positive CD40+/− littermates by centrifugal elutriation, the procedure which in our hands most effectively removes activated lymphocytes and other kinds of APC (12). Peptide Ag was used to bypass the B cell Ag receptor. We did not deplete T cells with Abs and complement because we found that complement treatment alone increased B7-2 expression on B cells after overnight culture. APC were not irradiated because small lymphocytes are extremely sensitive to ionizing radiation (49). Naive T cells specific for the C-terminal peptide of pigeon cytochrome c bound to the class II molecule I-Ek were isolated from spleens of AND TCR transgenic mice on the C57BL/10 (H-2b) background. The AND TCR can be positively selected on I-Ab in the thymus but cannot recognize PCCP on H-2b APC (44), effectively eliminating any contribution of APC contaminants in the T cell preparation. Fig. 1⇓A shows a comparison of proliferative responses of naive T cells to PCCP presented by small B cells vs. the large spleen cell fraction as a function of T cell number. In preliminary experiments using 7AAD and CFSE (not shown), we found that naive T cells are unable to induce proliferation in resting B cells, implying that T cells must differentiate into helper effector cells before they can do this. Therefore, we believe that most of the thymidine incoporation in these cultures is owing to the T cells rather than the B cells. Small B cells bearing CD40 are effective APC for naive T cells, although they are less effective than the large spleen cell fraction, which includes the dendritic cells. IL-2 may be limiting with small B cells as APC because thymidine incorporation falls to background at T cell numbers below 2 × 104/well. CD40-deficient small B cells were largely ineffective, inducing only a small residual response at high T cell numbers. CD40-deficient large spleen cells were somewhat less effective than CD40-positive large spleen cells, but this may be owing to the presence of many B cells in the large spleen cell fraction. To examine the role of CD40 in the APC function of non-B cells, we enriched for dendritic cells by overnight adherence of low-density spleen cells to plastic (48). Fig. 1⇓B shows proliferative responses of naive T cells to PCCP presented by this dendritic cell-enriched fraction compared with small B cells as a function of PCCP concentration and APC number. B cells with CD40 induce substantial T cell responses, but are much less effective than dendritic cells, particularly at low Ag and APC concentrations. CD40-deficient B cells are ineffective APC, while CD40-deficient dendritic cells are nearly as effective as CD40-positive dendritic cells at the Ag concentrations tested. Because proliferation in response to dendritic cells is largely CD40-independent, this experiment shows that the response to the CD40-positive small B cell fraction is owing to B cells and not to a small number of contaminating dendritic cells. If the response were owing to contaminating dendritic cells, then there would be little difference between the responses to the CD40-positive and CD40-negative B cell fractions. Proliferation of naive T lymphocytes in response to Ag presented on resting B lymphocytes is largely CD40 dependent. A, TCR transgenic T lymphocytes from AND mice and 105 small, resting B lymphocytes or large spleen cells were cultured with 5 μM PCCP. Data are representative of at least three independent experiments. B, Dendritic cells that do not express CD40 are nearly as effective as CD40-positive dendritic cells at inducing proliferation in naive T lymphocytes. A total of 105 TCR transgenic T lymphocytes were cultured with PCCP and CD40+/− small B cells, CD40−/− small B cells, CD40+/− dendritic cells, or CD40−/− dendritic cells. C, Five days after i.v. injection of CFSE-labeled TCR transgenic (AD10) spleen cells, mice were injected i.v. with 10 × 106 B10.BR or CD40−/− large or small cells that had been pulsed with 10 μM PCCP peptide in vitro. After 2.5 days, mice were sacrificed, and spleen cells were examined by flow cytometry. A total of 5 × 105 cells in the lymphocyte light scatter gate were analyzed, and the histograms show viable cells gated on Vα11 and Vβ3, the transgenic TCR. The unlabeled cells in the histograms are the variable background of host cells in that gate. Proliferation of naive T cells in response to Ag on small B cells is also largely CD40-dependent in vivo. This was determined by labeling PCCP-specific TCR transgenic T cells with CFSE in vitro before transfer into normal mice. As T cells labeled with this dye divide, the fluorescence intensity per cell is halved with each cell division. Five days after injection of CFSE-labeled, TCR transgenic T cells, small or large spleen cells from CD40-deficient or control mice, pulsed with antigenic peptide in vitro, were injected i.v. into groups of two mice. After 2.5 days, the mice were sacrificed, and splenic lymphocytes were examined by flow cytometry. Fig. 1⇑C shows histograms of representative mice, gated on the transgenic TCR. In mice injected with CD40-positive, peptide-pulsed small B cells, most of the TCR transgenic T cells have divided two to four times within 3 days of Ag exposure. T cells responding to large, CD40-positive spleen cells have gone through an additional cell division relative to those responding to Ag on small B cells. CD40−/− APC are severely deficient in this assay. Many of the recovered T cells have not divided in mice injected with peptide-pulsed CD40-deficient B cells, although a portion have divided one to three times. We do not yet know whether the limited proliferation seen is owing to Ag presented by the injected CD40-deficient B cells or to transfer of Ag to a host APC (14, 50). The response in vivo to CD40-deficient large cells is only slightly better than to the CD40-deficient small B cells. Having shown that CD40 is important for T cell proliferation in response to small B cells as APC, we proceeded to investigate the mechanism of the CD40 dependence. To determine whether CD40 is required for Ag recognition on small B cells, we measured increases in cell size and expression of the early-activation Ag, CD69, and the IL-2 receptor α-chain, CD25, by flow cytometry gated on Vβ3-positive (TCR transgenic) cells at various times of culture. In contrast to their inability to stimulate T cell proliferation on day 3, CD40-deficient small B cells are as effective as CD40-positive small B cells in initial presentation of PCCP to naive T cells, as shown by equivalent induction of activation markers at 12 h (Fig. 2⇓). Note that all of the T cells are expressing high levels of CD69 at that time. 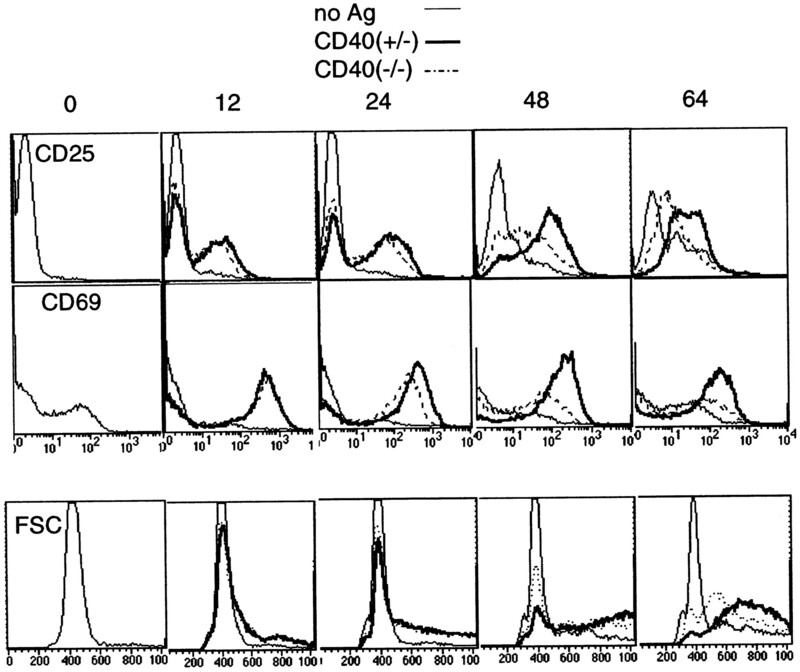 By 24 h, levels of CD69 are slightly lower on T cells recognizing Ag on CD40-deficient B cells, and by 48 and 62 h, large differences are apparent in CD25 expression, cell size, and CD69 expression. CD40-deficient small B cells are as effective as CD40-positive B cells at initial presentation of Ag to naive T cells. A total of 105 TCR transgenic T lymphocytes were cultured with 105 small B lymphocytes and 5 μM PCCP. Vβ3-positive cells were examined for CD25 and CD69 expression along with forward light scatter. Data are representative of at least two independent experiments. The interaction between CD40 and its ligand, CD40L, has been reported to deliver activating signals in both directions, through CD40 to the APC (19) and through CD40L to the T cell (51, 52, 53, 54). 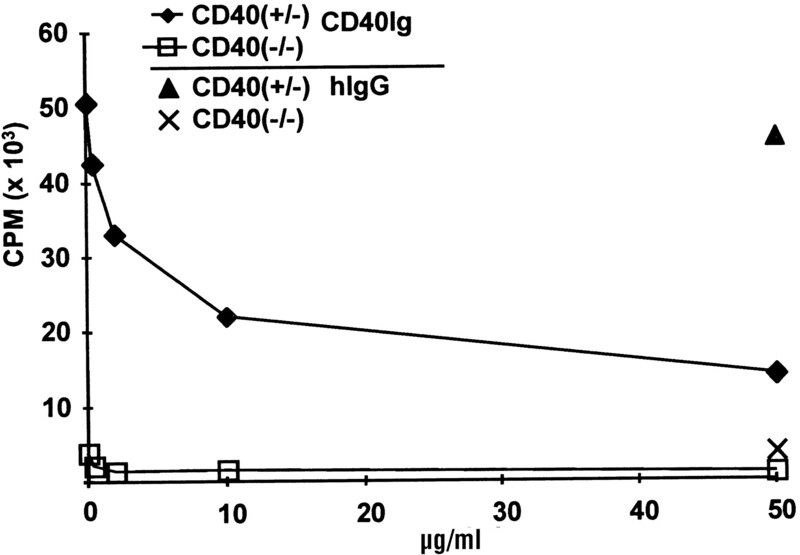 To test whether CD40 is required on the B cell solely to provide a signal to the T cell through CD40L, we added an excess of soluble CD40Ig fusion protein (20) to engage CD40L on the T cells in cultures with CD40-deficient B cells (Fig. 3⇓). Although signaling through CD40L to the T cell has been demonstrated in vitro with anti-CD40 Abs (52), cells expressing CD40 as a membrane molecule (53), or solubilized membrane CD40 molecules (54) rather than with soluble CD40Ig, CD40Ig has the potential for multivalent presentation to T cells through binding to B cell Fc receptors, as occurs with anti-CD3 (39), and might be expected to deliver a comparable signal to the T cells in our system. However, at no concentration did CD40Ig restore the proliferative response of naive T cells to CD40-deficient B cells. Instead, it largely but not completely blocked T cell proliferation in response to CD40-positive B cells, confirming the previous results with CD40-deficient B cells and indicating that CD40 enhances the T cell proliferative response through activation of the Ag-presenting B cell. CD40Ig fusion protein does not augment proliferation of naive T lymphocytes in response to resting CD40−/− B lymphocytes. A total of 105 naive T lymphocytes and 105 resting CD40+/− or CD40−/− B lymphocytes were cultured with 5 μM PCCP and CD40Ig or human IgG as a control. Proliferation was assessed on day 3. Data are representative of two independent experiments. If CD40L/CD40 acts by up-regulating costimulatory activities of small B cells, then the requirement for CD40L/CD40 should be obviated if cosimulatory activities are provided in other ways. Like activation through CD40, activation of small B cells through the B cell Ag receptor enhances Ag presentation by up-regulation of adhesion and costimulatory molecules (35, 55). When the small B cells were activated by addition of anti-Ig to the cultures, there were no differences in the abilities of CD40-deficient or CD40-positive B cells to induce sustained activation and survival of the naive T cells, as measured by CD25 expression, cell size and recovery, and DNA content on day 3 of culture (Fig. 4⇓A). This experiment also shows that B cells developing in CD40-deficient mice are capable of inducing naive T cell proliferation if they are appropriately activated through another pathway. To determine whether costimulatory signals are limiting, costimulation was provided with an agonist Ab to CD28, which also restored naive T cell activation measured on day 3 in response to peptide on CD40-deficient B cells (Fig. 4⇓A). T cell proliferation as measured by thymidine incorporation was also restored by anti-CD28 (data not shown). To determine whether B7 expression on the CD40-deficient B cells could be limiting, CD40-deficient mice were bred with B7-1 transgenic mice that constitutively express high levels of B7-1 on B lineage cells (45). As shown in Fig. 4⇓B, constitutive expression of B7-1 enhanced the T cell response to CD40-positive B cells and partially restored the ability of small, CD40−/− B cells to induce proliferation of naive TCR transgenic T cells. Therefore, CD40-deficient small B cells fail to provide adequate costimulatory signals to naive T cells. A, A signal through the B lymphocyte Ag receptor or through CD28 enhances activation of naive T lymphocytes in response to PCCP presented on resting CD40−/− B lymphocytes. A total of 105 T lymphocytes were cultured with either 105 CD40+/− or CD40−/− small B lymphocytes and 5 μM PCCP, anti-CD28 (optimal dilution), or goat anti-mouse IgG + IgM (H+L) (5 μg/ml). On day 3, Vβ3-positive cells were examined for increase in cell size (forward scatter), DNA content (7AAD staining), and expression of CD25. Data are representative of three independent experiments. B, Expression of B7-1 constitutively on small CD40−/− B lymphocytes partially restores their ability to induce proliferation of naive T lymphocytes. A total of 105 naive T lymphocytes were cultured with the indicated number of CD40+/− B7-1 transgene-negative, CD40+/− B7-1 transgene-positive, CD40−/− B7-1 transgene-negative, or CD40−/− B7-1 transgene-positive small B lymphocytes and the indicated concentration of PCCP or PCCP plus 50 U/ml of exogenous IL-2. Because the preceding results implicated costimulatory signals, we looked directly by flow cytometry at surface expression of costimulatory molecules on CD40-positive and CD40-deficient small B cells at various times of culture with naive TCR transgenic T cells and peptide. As shown in Fig. 5⇓A, naive T cells induced B7-2 expression on resting B cells with or without CD40 at 12 h of culture. B7-2 up-regulation was dependent on the presence of the antigenic peptide. By 24 h, fewer CD40-deficient B cells expressed high levels of B7-2, and sustained expression of B7-2 at 48 and 64 h was largely CD40-dependent. Induction of B7-1 occurred later than B7-2, beginning at 24 h, and was completely CD40-dependent, as was increased expression of CD44H. ICAM-1 (CD54) expression was increased several-fold at 12 h on all B cells, including those without CD40, but gradually became very bright on CD40-positive B cells between 12 and 64 h. Because IL-4 (56) as well as activated T cells (23) or CD40L transfectants (24) can induce B7 expression on resting B cells, we asked whether CD40-dependent induction of sustained B7-2 expression requires cell contact or is owing to soluble mediators in this system. In cultures of mixed CD40-positive and CD40-deficient B cells, the CD40-positive B cells showed much higher levels of B7-2 expression at 48 h, indicating a likely requirement for a direct signal from CD40L on the T cell through CD40 on the B cell (Fig. 5⇓B). We conclude that CD40 is not required for the initial T cell- and Ag-dependent increase in B cell B7-2 and ICAM-1 expression but is required for later induction of B7-1 and increased expression of CD44H as well as for large and sustained increases in B7-2 and ICAM-1. Expression of costimulatory molecules on CD40-deficient resting B lymphocytes after culture with T lymphocytes and PCCP. A, A total of 105 T lymphocytes were cultured with 105 CD40+/− or CD40−/− B lymphocytes and 5 μM PCCP. At the indicated times, B lymphocytes (B220+ cells) were examined for expression of B7-2, B7-1, CD44, and ICAM-1. Data are representative of two independent experiments. B, B7-2 is expressed at high levels on resting CD40+/− but not on CD40−/− B lymphocytes when cultured in the same well with T lymphocytes and PCCP. A total of 105 T lymphocytes were cultured with 105 CD40+/− and 105 CD40−/− resting B lymphocytes and 5 μM PCCP. On day 2, cells were stained for expression of CD40, CD19, and B7-2. Expression of B7-2 on CD40+/− and CD40−/− B lymphocytes (CD19-positive cells) is shown. We used blocking Abs to determine which of these costimulatory molecules is necessary for proliferation of naive T cells in response to peptide on small B cells. Anti-B7-2 Ab blocked T cell proliferation quite effectively including the small residual response to CD40-deficient small B cells, whereas anti-B7-1 Ab was without effect (Fig. 6⇓A) at concentrations up to 50 μg/ml (data not shown). Anti-ICAM-1 also blocked effectively, wheras anti-CD44H had very little effect on proliferation in cultures without IL-2 supplementation (Fig. 6⇓B). Supplementation of cultures with excess IL-2 completely restored the responses inhibited by anti-B7-2 Ab (Fig. 6⇓A) but only partially restored responses inhibited by anti-ICAM-1 (Fig. 6⇓B), indicating that ICAM-1 plays a role in Ag recognition and induction of IL-2 responsiveness as well as in IL-2 production and subsequent proliferation. Curiously, anti-CD44H has a small but measurable inhibitory effect on proliferation only in IL-2-supplemented cultures (Fig. 6⇓B). A, An Ab to B7-2 blocks proliferation of naive T lymphocytes to PCCP presented on resting B lymphocytes, but an Ab to B7-1 does not. A total of 105 T lymphocytes were cultured with 105 resting B lymphocytes, 5 μM PCCP, and anti-B7-2 (0.2 mg/ml) or anti-B7-1 (0.2 mg/ml) with or without IL-2 (50 U/ml). Data are representative of two independent experiments. B, An Ab to ICAM-1 blocks proliferation of naive T lymphocytes to PCCP presented on resting B lymphocytes, but an Ab to CD44H does not. A total of 105 TCR transgenic T lymphocytes were cultured with 105 resting B lymphocytes, 5 μM PCCP, and various concentrations of anti-ICAM-1 or anti-CD44H with or without 50 U/ml of exogenous IL-2. Data are representative of two independent experiments. 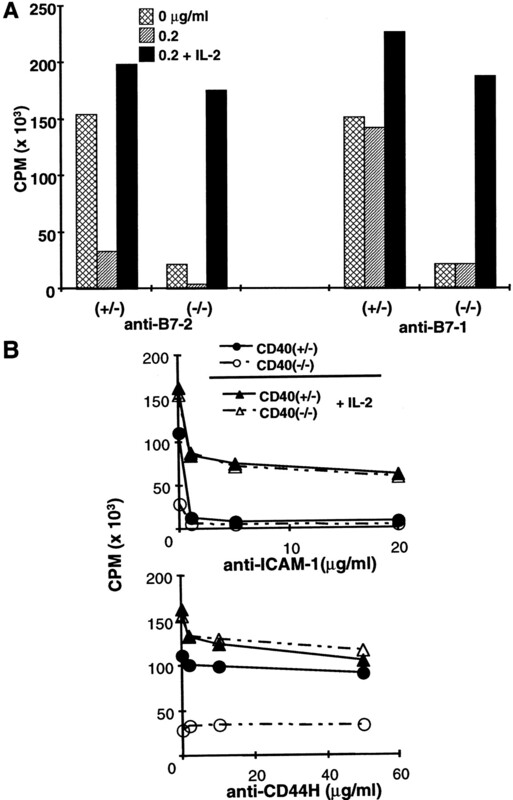 As shown above, B7-2 is induced transiently on CD40-deficient B cells, but sustained expression of high levels of B7-2 and ICAM-1 requires CD40. If sustained expression of B7-2 or ICAM-1 were to account for CD40-dependence of T cell proliferation, then delayed addition of the respective Ab could still block T cell proliferation. Anti-B7-2 added at 24 h still caused nearly complete inhibition of T cell proliferation (Fig. 7⇓A). Even at 40 h, anti-B7-2 substantially inhibited proliferation measured at 72 h (Fig. 7⇓A). Late addition of anti-ICAM-1 also had some effect on proliferation, consistent with a costimulatory role for ICAM-1 (57). These results indicate that the inability of the CD40-deficient B cells to support proliferation of naive T cells may be owing to lack of sustained expression of high levels of B7-2 and ICAM-1, which depends on CD40. Sustained expression of B7-2 and ICAM-1 are required for maximal proliferation of T lymphocytes. A total of 105 T lymphocytes were cultured with 105 CD40+/− B lymphocytes and 5 μM PCCP. At 0, 24, and 40 h after initiation of culture, anti-B7-2 (0.2 μg/ml) (A), or anti-ICAM-1 Abs (B) were added with or without exogenous IL-2 (50 U/ml). Data are representative of three independent experiments. Th1 T cell lines that recognize Ag but fail to proliferate without adequate costimulation are rendered anergic and fail to proliferate in response to subsequent Ag with costimulation (58). We examined whether anergy is induced in naive T cells which fail to proliferate after recognition of Ag on small, CD40-deficient B cells. Following primary culture with peptide and small B cells for 3 days, viable cells were recovered and placed in secondary culture with whole spleen APC and peptide. T cells cultured with CD40-deficient B cells and peptide remain about as responsive as fresh naive cells upon secondary culture with whole spleen APC, although there was some variation among experiments as shown in Fig. 8⇓. T cells cultured with CD40-positive B cells sometimes showed enhanced responses at low T cell densities or showed reduced responses at higher T cell densities in secondary cultures (Fig. 8⇓D), perhaps reflecting production of effector cytokines. Cell recoveries from cultures of T cells and small B cells without peptide were very low, and the remaining viable cells were completely unresponsive on secondary culture (Fig. 8⇓C). Therefore, the effect on naive T cells of Ag recognition on CD40-deficient B cells without adequate costimulatory signals is not anergy or activation-induced death, but survival in culture. T lymphocytes remain responsive in secondary culture after prior exposure to PCCP on either CD40+/− or CD40−/− resting B lymphocytes. 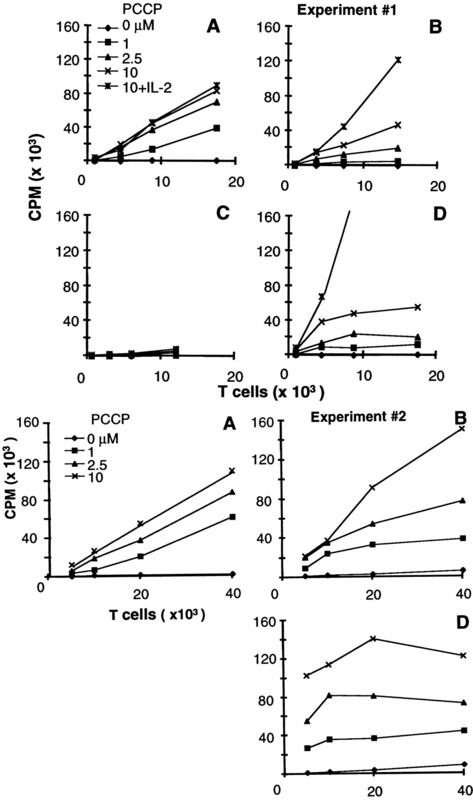 After 3-day primary cultures with CD40+/− or CD40−/− B cells as APC, viable T cells were recovered and cultured again with 105 T-depleted spleen cells and 5 μM PCCP. A, Freshly isolated T lymphocytes. B, T lymphocytes from prior culture with CD40−/− B lymphocytes and 5 μM PCCP. C, T lymphocytes from prior culture with CD40+/− B lymphocytes and no PCCP. D, T lymphocytes from prior culture with CD40+/− B lymphocytes and 5 μM PCCP. Results of two independent experiments of three are presented. We show here that naive T cells are activated and proliferate when Ag recognition occurs on resting B cells in vitro and in vivo, even in the absence of a B cell Ag receptor signal. The activation Ags, CD69 and CD25, are induced (Ref. 41 ; Fig. 2⇑), and although IL-2 production is limiting (Refs. 33, 41 ; Figs. 4⇑B and 7), it is sufficient for T cell proliferation (Ref. 38 ; Figs. 1⇑, 3⇑, 4⇑B, 6, and 7). It has been debated whether the level of CD40L induced on naive T cells during cognate interaction with small B cells is sufficient for induction of costimulatory molecules necessary for T cell activation (25, 33, 39, 41). We used B cells from CD40-deficient mice to show that T cell proliferation and long-term expression of CD69 and CD25 (Figs. 1⇑ and 2⇑) depend on CD40. This CD40-dependence demonstrates that CD40L is induced at levels sufficient to facilitate productive intercellular communication between naive T cells and CD40-positive resting B cells. In this study, the mechanism through which CD40 signaling influences interactions between T cells and small B cells was rigorously examined. Although cross-linking of CD40L in conjunction with engagement of the TCR has been shown to promote T cell activation and cytokine production (51, 52, 53, 54), a signal through CD40L is not the mechanism through which CD40 promotes T cell activation in this study. First, addition of a CD40Ig fusion protein failed to enhance T cell activation when peptide Ag was presented on CD40-deficient B cells (Fig. 3⇑), suggesting that engagement of CD40L alone is not sufficient to overcome the lack of CD40 expression on B cells. Furthermore, signaling through CD40L is not required for T cell activation when CD40-deficient B cells are stimulated with soluble anti-Ig (Fig. 4⇑A). Finally, Ab-mediated cross-linking of CD28 enables T cell proliferation during cognate interaction with CD40-deficient B cells (Fig. 4⇑A), and constitutive expression of a B7-1 transgene by CD40-negative B cells enhances T cell proliferation (Fig. 4⇑B). Taken together, these results indicate that up-regulation of costimulatory molecules on B cells, rather than signaling through CD40L, is limiting during cognate communication between naive T cells and CD40-deficient B cells. It is well established that CD40 regulates expression of several costimulatory and adhesion molecules on APC (22, 23, 24, 25, 27). However, the relative importance of various costimulatory molecules on resting B cells during cognate communication with naive T cells has not been established. CD44H, an isoform of CD44 and a proposed costimulatory molecule, is up-regulated in a CD40L-dependent manner on resting B cells during interaction with anti-CD3-activated T cells (39, 59) or T cells activated by resting B cells presenting Ag (Fig. 5⇑A). In contrast to previous work by Wu et al. (39) using fixed, activated B cells, we found that CD44H did not play a role in T cell activation when a peptide Ag was presented on viable resting B cells because blocking Abs to CD44H did not reduce T cell proliferation (Fig. 6⇑B). This discrepancy in the relative importance of CD44H is likely due to differences in the experimental systems employed. Peptide-MHC complexes on resting B cells may deliver a quantitatively different signal to T cells than anti-CD3, which could affect the contribution of CD44H to T cell activation. Also, because fixation destroys costimulatory functions of APC (60), CD44H may contribute to CD40-dependent costimulation only when other molecules such as B7-1 and B7-2 are inactivated by fixation (39). Another molecule that may contribute to CD40-dependent T cell activation is ICAM-1 (CD54) (Ref. 61 ; Fig. 6⇑B). ICAM-1 is expressed on resting B cells and is further up-regulated by CD40 during noncognate (61) and cognate (Fig. 5⇑A) communication with naive T cells. The importance of up-regulation of ICAM-1 for CD40-dependent T cell activation is not clear. The inhibition of T cell proliferation, even in the presence of exogenous IL-2, by Abs that block ICAM-1 (Fig. 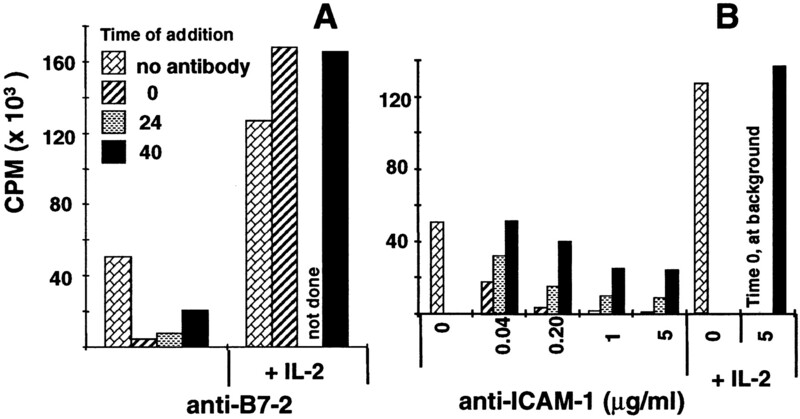 7⇑B) indicates that ICAM-1 is critical for initial Ag recognition or adhesion between T and B cells. Thus it is difficult to assess the importance on T cell activation of further up-regulation of ICAM-1 by CD40. However, ICAM-1 may also play a costimulatory role independent of adhesion (57) because late addition of an anti-ICAM-1 Ab inhibited proliferation to PCCP in the absence but not in the presence of exogenous IL-2 (Fig. 7⇑B). Sustained expression of B7-2 and induction of B7-1 on resting B cells requires CD40 during cognate communication with naive T cells (Fig. 5⇑A). Previous studies by Roy et al. (25) demonstrated that blocking CD40L with an Ab could partially inhibit induction of B7-1 and B7-2. The inability of the anti-CD40L Ab to completely prevent induction of B7 might have been due to either incomplete blocking of CD40L or CD40L-independent induction of B7. The lack of B7-1 induction on CD40-deficient resting B cells during cognate communication with naive T cells clearly demonstrates that induction of B7-1 on resting B cells requires expression of CD40 under these conditions (Fig. 5⇑A). Examination of B7-2 expression on CD40-deficient B cells demonstrates unambiguously that B7-2 is induced independently of CD40 on resting B cells during cognate communication with naive T cells, but the expression is not sustained (Fig. 5⇑A). The transient induction of B7-2 on CD40-deficient B cells may be a consequence of the same non-CD40, contact-dependent signals that induce c-myc expression in naive B cells presenting Ag to Th2 cells (20). Sustained induction of B7-2 requires cell contact (Fig. 5⇑B) and, therefore, may be a direct consequence of sustained CD40 ligation by CD40L. Because B7-1 induction on resting B cells requires CD40, it was possible that the CD40 contribution to T cell activation was mediated by induction of B7-1. However, this is not the case in this system because blocking B7-1 has little or no effect on T cell proliferation in response to resting B cells (Fig. 6⇑A), spleen cells (25), or activated B cells (55). This is consistent with in vivo models in which blocking CD40L inhibits cardiac allograft rejection and induction of B7-1, but blocking B7-1 does not increase cardiac allograft survival (31). The inability of anti-B7-1 Abs to inhibit proliferation to APC (Ref. 25 ; Fig. 6⇑A) does not mean that B7-1 does not function in T cell activation. Constitutive expression of B7-1 can enhance the ability of B cells to activate T cells (Fig. 4⇑B) and block tolerance induction by B cells in vivo (13), and B7-1 can compensate for the absence of B7-2 in Ab responses in vivo (62). Our studies may not reveal a role for B7-1 in T cell responses because it is expressed too late to influence the T cell activation parameters examined (Fig. 5⇑A). Blocking studies have demonstrated that B7-2 is necessary for T cell proliferation and cytokine production in response to Ag presentation by resting B cells (Refs. 25, 33 ; Fig. 6⇑A), but previous studies have disagreed about the contribution of CD40L/CD40 to B7-2 expression on resting B cells during T/B interactions (5, 25, 38, 39, 63). Cook et al. (38) strangely failed to see induction of B7-1 or B7-2 expression on B cell-presenting peptide Ag to naive or primed T cells over several days of culture. Constant (5) reported that CD40L was not required for T cells to sustain BCR-induced B7-2 expression on Ag-presenting B cells at 24 h in vivo. Similarly, Wu et al. (39) concluded that B7-2 expression did not explain CD40L-dependent costimulatory activity of B cells because equivalent levels of B7-2 were observed at 14 h on B cells after interaction with either CD40L-positive or -negative T cells. However, a difference in B7-2 expression may have been observed in these two studies if B7-2 expression had been examined at later times. The ability of an anti-B7-2 Ab to inhibit T cell proliferation, even when delayed by 40 h, clearly demonstrates that sustained expression of B7-2 is critical for T cell activation during cognate communication with resting B cells (Fig. 7⇑A). The requirement for sustained B7-2 expression for optimal T cell activation is consistent with studies using other APC indicating that CD28 is necessary for sustained T cell proliferation and survival but not for initial T cell proliferation (64). Thus, both kinetics and level of expression of B7-2 on resting B cells are important for T cell activation during cognate communication. Regulation of B7-1 and B7-2 expression by CD40 may alter the balance between positive and negative signals through CD28 and CTLA-4, respectively. Although CD28 and CTLA-4 both bind to B7, they have opposing roles in T cell activation (65). Due to the 20-fold higher affinity of CTLA-4 compared to CD28 for B7, low levels of B7 may result in preferential engagement of CTLA-4 thereby delivering a negative signal that inhibits T cell activation. Because B7-2 levels decline rapidly on CD40-deficient B cells during cognate communication with naive T cells, CTLA-4 might predominate at later times. However, in several experiments we were unable to demonstrate a consistent effect of whole or Fab fragments of anti-CTLA-4 Ab on T cell proliferation to PCCP presented on resting B cells (data not shown). Dendritic cells (Fig. 1⇑B) and unfractionated spleen cells (Ref. 26 ; Fig. 1⇑A), in contrast to resting B cells, can activate naive T cells in vitro even in the absence of CD40/CD40L, presumably because these cells constitutively express costimulatory molecules or because expression is induced by the isolation procedures and culture conditions. Because signaling through CD40 enhances expression of MHC class II and B7 on dendritic cells (27), CD40 may still contribute to T cell activation by dendritic cells or other non-B APC in vivo, as shown in Fig. 1⇑C. 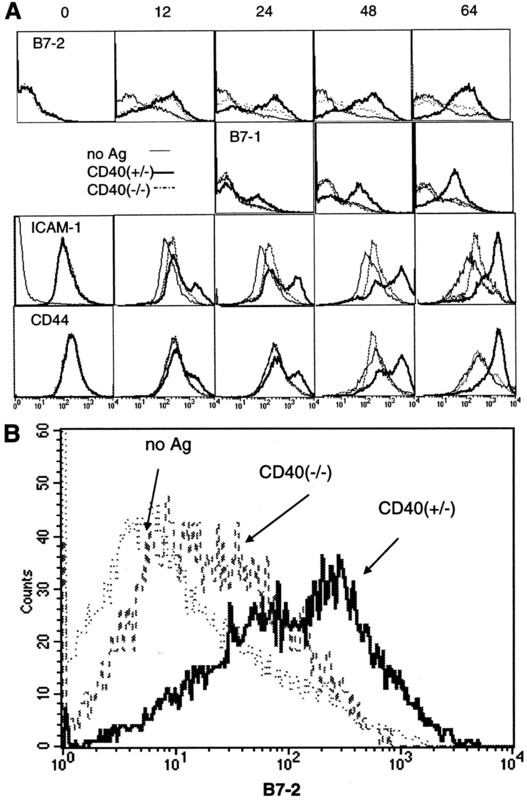 CD40 signals may also enhance presentation by activated B cells if the Ag signal is limiting. Holländer et al. (43) found that purified B cells deficient in CD40 were unable to stimulate proliferation of allogeneic T cells in vitro unless activated by LPS. Because they irradiated the B cells with 2000 rads, it is likely that they were looking at CD40-dependent presentation of low-avidity alloantigens by radioresistant, activated B cells or other contaminating APC. Because B cells are effective at tolerizing APC in vivo (10, 11, 12, 13, 14, 15), we initially expected peptide-pulsed B cells to induce unresponsiveness in T cells in vitro, particularly under conditions in which the T cells did not proliferate. Instead, we found that Ag recognition on small B cells without adequate costimulation left the T cells responsive to other APC and delayed spontaneous T cell death in culture (Fig. 8⇑). Croft et al. (41) reported that T cells were less responsive to Ag after prior exposure to Ag on resting B cells compared with Ag on ICAM-1/B7-1-transfected fibroblasts, but in those experiments the response of T cells cultured with B cells and peptide was equivalent to that of freshly isolated T cells, indicating that they were not left anergic after interacting with B cells. Therefore, these in vitro studies do not provide support for immediate T cell anergy or death as the mechanism by which resting B cells induce tolerance. Other investigators have found it impossible to induce anergy in primary T cells in vitro (66, 67, 68). Anergy, initially defined in Th1 cell lines (58), may be a function limited to memory or effector T cells rather than a mechanism of tolerance in primary cells. Indeed, studies on responses of naive T cells to tolerizing forms of Ag in vivo invariably report vigorous Ag-driven proliferation as a prelude to death or anergy (14, 15, 69, 70, 71, 72). The decision between immunity and tolerance may involve later signals that enable proliferating cells to survive and differentiate to effector cells and memory cells (64, 73). Resting B cells, and perhaps some other APC such as resident dendritic cells (50), may be tolerogenic not because they fail to induce T cell proliferation, but because they fail to deliver these later, additional signals. Indeed, constitutive expression of B7-1 on Ag-presenting B cells interferes with tolerance induction but does not allow B cells to prime helper T cells in vivo (13), implying that B7-positive B cells are deficient in some other signals necessary for a productive T cell response. It remains to be determined whether Ag recognition without T cell proliferation on CD40-deficient B cells or other APC results in T cell tolerance in vivo and, more generally, whether T cell proliferation is a necessary step in tolerance induction. We thank Hitoshi Kikutani and his colleagues for the CD40-deficient mice, Jonathan Kaye and Steven Hedrick for the TCR transgenic mice, Gordon Freeman for the B7-1 transgenic mice, Yang Liu for Abs, James Allison for hybridoma cells, and Marilyn Kehry for the cell line-secreting CD40Ig fusion protein. ↵1 This work was supported in part by National Institutes of Health Grants RO1-AI24303 and RO1-AI29544. ↵2 Current address: Earle A. Chiles Research Center, Robert W. Franz Cancer Research Center, Providence Portland Medical Center, 4805 NE Glisan Street, Portland, OR 97213. ↵3 Current address: Department of Pediatric Immunology, Allergy, and Rheumatology, Box 777, University of Rochester Medical Center, 601 Elmwood Avenue, Rochester, NY 14602. ↵5 Abbreviations used in this paper: CD40L, CD40 ligand; 7AAD, 7-aminoactinomycin D; CFSE, 5-(and 6)-carboxyfluorescein diacetate succinimidyl ester; HBSS, HEPES-buffered HBSS; PCCP, pigeon cytochrome c peptide residues 88–102. Inaba, K., W. J. Swiggard, R. M. Steinman, N. Romani, G. Schuler. 1998. Isolation of dendritic cells. J. E. Coligan, Jr, and A. M. Kruisbeek, Jr, and D. H. Margulies, Jr, and E. M. Shevach, Jr, and W. Strober, Jr, eds. Current Protocols in Immunology 3.7.1 Wiley, New York.